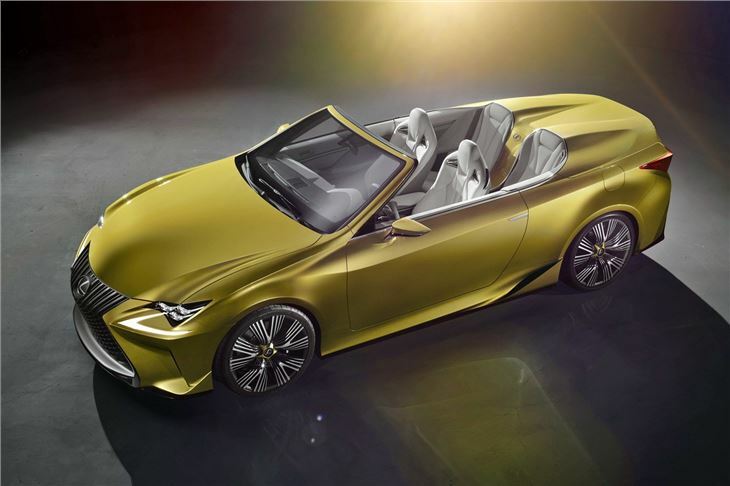 4-seat convertible version of Lexus LF-RC coupe built as a direct rival to the BMW 4-Series coupe and convertible. Expect in UK in 2016. The LF-C2 concept displays an experimental rendering of Lexus’s signature spindle grille design, using a braided mesh effect which represents Lexus craftsmanship, and which changes appearance when viewed from different angles and in different light. 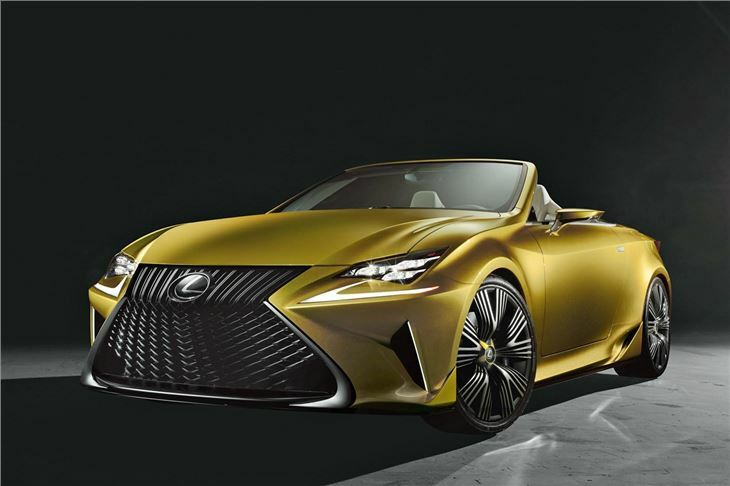 It sits between triangular LED headlights – a shared feature of Lexus sports cars – and indicator lights that initiate a character line that sweeps through the arrow-shaped body to the car’s abbreviated tail section. Vents in the front bumper direct cooling air to the brakes and help manage airflow to keep the front end stable at high speed. The profile displays a sweeping line from the front bumper fin to the steeply angled A-pillar. Small vents in the side sills direct air to the rear brakes, exiting through fin-like rear diffusers. The rear end features L-shaped tail lights, chrome-tipped quad exhaust pipes and a pronounced new rear diffuser design. 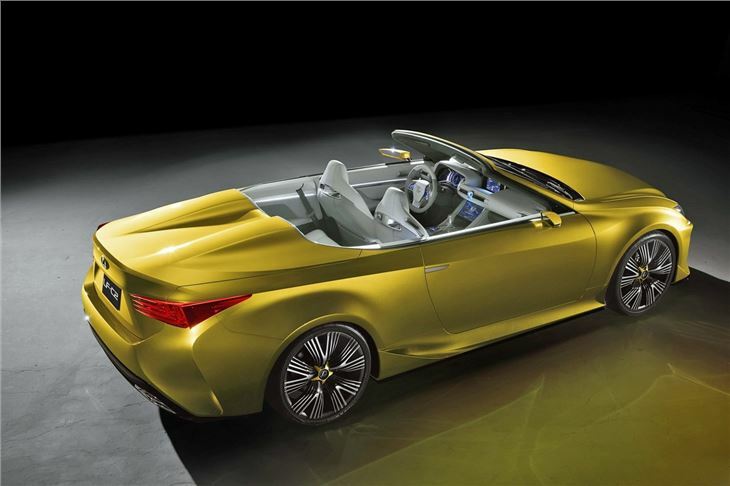 The concept is fitted with five-spoke 20-inch alloy wheels. Inside, the cabin is spacious and luxurious, matching the sporting elegance of the exterior. In fact the exterior styling extends into the cabin, with the centre console originating from the rear deck in a line that runs the length of the cabin to the dashboard. The dashboard itself displays a functional simplicity with an attractive but straightforward instrument cluster, a central video monitor controlled by a Remote Touchpad and a classic analogue clock set between the central air vents. The qualities of a driver’s car are reflected in the thick, leather-wrapped steering wheel and form-fitting seats. The interior designers sought a balanced atmosphere of power and simplicity that connects with the primary senses: white and grey leather surfaces are soft to the touch, and LED lights run the length of the interior below the window line.